Patients are always seeking the best doctors they can find, and for good reason. But it may not always be easy to know who to choose. 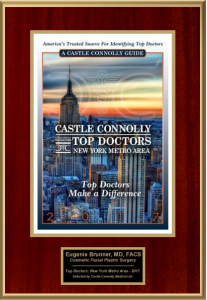 One excellent way of identifying a highly-skilled, extensively trained facial plastic surgeon is through the Castle Connolly “Top Doctors” list. The Castle Connolly organization curates a selection of physicians for each specified region, and each one must pass a stringent review process to be named. A doctor cannot pay to be included, and a physician must be nominated by his or her peers to become eligible. Dr. Eugenie Brunner is honored to have been included on the list many times, and 2017 marks the eighth year in a row she has been named one of the “Top Doctors” for the New York Metro Area. Some of the many factors that are taken into consideration for this award are the physician’s educational background, training, disciplinary history, hospital appointments, and other qualifications. In addition to valuing the requirements reviewed for the “Top Doctors” achievement, Dr. Brunner also believes compassion, patient care, and remaining at the forefront of facial plastic surgery and non-surgical aesthetic enhancement are worthy qualities keep in mind when selecting a facial plastic surgeon. Our entire team wishes Dr. Brunner congratulations on her latest accolade. Together our medical team is dedicated to providing exceptional care and excellent outcomes to each of our patients. To learn more about the Castle Connolly distinction, or to schedule a consultation, please contact our practice.